The second day of the 2014 Sierra Challenge found us hiking to Mt. Andrea Lawrence, recently named for the long-time Mammoth Lakes resident who won two Olympic gold medals in alpine skiing almost 60yrs ago and spent the last half of her life involved in environmental causes on the East Side. The outing would involve more than 20mi of hiking with over 6,000ft of gain. Starting from the Rush Creek TH at Silver Lake, we found the large lot completely full before 6a on a Saturday morning. Only a handful of these were taken up by Challenge participants. Most of us had to park somewhere along the road or in the questionable parking spots - this is one busy trailhead. In the bustle of getting almost 20 folks heading out at the 6a start time, I completely forgot to gather them for a group photo at the TH sign. It was already too late when Jonathan reminded me, but I snapped one with the few lingerers anyway. Off we went. After first traveling half a mile through forest on the backside of an RV campground, the trail begins to climb out of the large valley formed by Rush and Reversed Creeks, Silver Lake in the shadows behind us with Carson Peak to the south catching some of the first rays of the new day. Leading up to Agnew Lake is an ancient tram line, still in use, that offers a steep shortcut to the switchbacking trail. It only takes one person to start up in order to get everyone following in turn. There is a similar set of thigh-burning railroad tie steps in Hawaii at Koko Head Park that I had visited a few months earlier. That one, however, no longer has an active tram running on it. Near the dam at Agnew Lake we rejoined the trail and continued along it for the next several hours, passing around Agnew, Gem and Waugh Lakes, in turn. Water levels were low, as might be expected in drought conditions, but they still made for picturesque reflections with calm waters in the early morning hours. Views are somewhat limited as much of the hiking takes place through dense forest, at least until one gets above Waugh Lake where views begin to open more. It was around 9a when we started to leave the trail for several miles of cross-country travel to Andrea Lawrence. Though about ten of us were still hiking in a group along the trail, this rapidly broke up into smaller groups as we left it at various points. It was a mix of easy forest travel and even easier slabs, gaining more than 1,000ft before the forest finally relented and gave way to granite talus, boulders and slabs. As we cleared the treeline we had a tremendous view behind us of Banner/Ritter and other surrounding summits. By 9:30p we had reached the SE Ridge of Andrea Lawrence in the vicinity of Lost Lakes with another 1,300ft to go. Jonathan and his nephew Andrew were both just ahead of me at this point. Andrew chose the more technical class 3 ridge itself while Jonathan traversed right to find easier ground. I ended up on a line somewhat between these two. The jagged Koip Crest rises on the right skyline above Lost Lakes. It seemed to take a very long time to climb the SE Ridge with several false summits, about an hour from the time we had first gained the ridge - not a very quick pace for about 3/4mi distance. But the scrambling had been full of class 3 trickery, oddly combining fun and annoying in the same setting. When we arrived at the top at 10:30a, we found three rock outcrops vying for the highpoint. We checked all three for elevation and registers (finding none) and settled on the NE point as the highest. Greg popped his head up a few minutes later as did Eric. Eric had just dashed over from Donohue Peak where he had gone first. 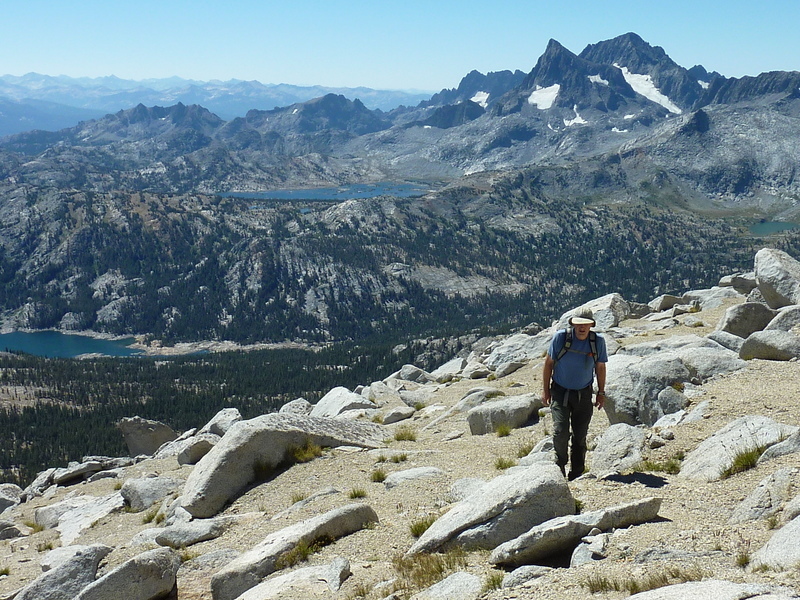 He paused to eat lunch with our growing group and socialize before he took off heading east on an ambitious outing - he was traversing the crest to Blacktop and Kuna Peak before turning east to tag Koip, Parker and Woods, followed by a long descent back down to Silver Lake. The view south from Andrea Lawrence takes in most of the upper drainage of Rush Creek and beyond to the Middle Fork of the San Joaquin River drainage, the Ritter Range, Mammoth Mtn and the Silver Divide on the far horizon. To the west lie the twin summits of Lyell and MaClure in Yosemite NP, to the NW the broad, green swath of Lyell Canyon, and to the north and east the long sweep of the Kuna and Koip Crests. After 20 minutes we had assembled a group of seven at the summit. Jonathan provided another new register which we left in a small cairn before starting to descend. In all there were 19 or 20 folks that reached the summit of Andrea Lawrence. JD went to Kuna/Koip afterwards, though he bypassed the serrated Koip Crest that Eric had traversed. JD met Liz at Koip who had forgone Andrea Lawrence, hiking up the Gem Pass Trail. The two of them then continued to Parker and Wood before dropping down to Silver Lake much like Eric. Eddie had thought the Mono Pass TH would be a better access point for Andrea Lawrence, starting and finishing there in a tough 15hr+ day that disproved his theory.